It’s that time of the week again, when I open the doors to the world of ‘Whimsy Wood’ and let you know what’s been going on! Well, as you may or may not know, I was up in the lovely county of Lincolnshire last Thursday, visiting 2 smashing primary schools! The first being Swineshead St. Mary’s and the second being Sutterton Fourfields. I think I can happily say that I had a fabulous time reading my 4th ‘Whimsy Wood’ book, ‘Posie Pixie And The Fireworks Party’, to the 90 key-stage 1 children! They asked me some great questions afterwards too. One of these questions was…. “What do you like best about being an author?” It really didn’t take me long to think about the answer to this, as I love being able to get lost in my imagination while I write. “I don’t know if my imagination is pink, or purple, or rainbow coloured,” I replied to the wee girl sat on the floor, looking curiously at me. “I don’t know if it’s fluffy, or sparkly, or smells of sweets, as it’s tucked away in my head! What I do know, is that I can use my imagination whenever and wherever I like. It can take me to amazing places, without me even leaving my chair and it doesn’t cost me a penny. That’s what I like most about being an author.” The wee girl thought about this and then said…. “Hmmm.” I hoped this meant that she was suitably satisfied with my answer! Now, I shall be returning to the lovely land of Lincolnshire in a few weeks time, as I have been invited to be the guest speaker at the Boston High School annual dinner, on Saturday October the 18th! This dinner is for ex-pupils of the school and having attended there myself many moons ago, I shall really look forward to going back! Having said that, the thought of standing up in front of a room of grown-ups and talking for twenty minutes really terrifies me!! I love talking to children, taking assemblies and creative writing workshops in schools, but a whole bunch of adults….well…., that’s a different matter entirely!! If I was ‘Posie Pixie’ or ‘Fearne Fairy’, 2 of my ‘Whimsy Wood’ characters, then I would want to run away and hide from such a scary thing! Fairy Toadstools (otherwise known as ‘Fly Agaric’) for ‘Whimsy Wood’ folk to hide under! “What would you hide under?” I hear you cry. 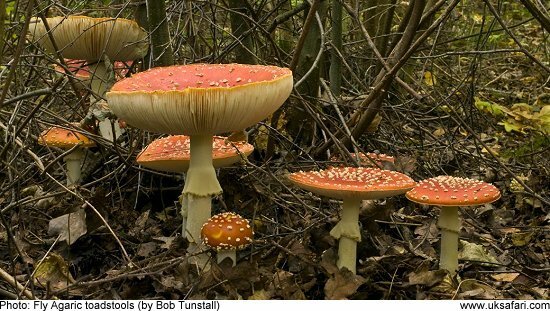 It would have to be the ‘Fly Agaric’ toadstool of course! This fabulous fungus is iconic where fairy tales are concerned and is currently growing happily in ‘Whimsy Wood’! No doubt it is popping up in woodlands everywhere as we speak, as it loves the warm, wet weather that we’ve been having! If you’re heading out for a woodland walk sometime this month, then keep your eyes peeled for these fairy toadstools, especially around birch trees, which they’re rather fond of! See if you can spot the odd pixie, or fairy that may be lurking underneath too while you’re at it! I would love to carry on waffling, but I really must get on! 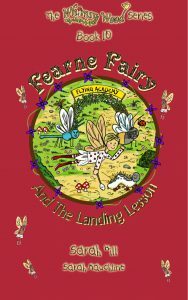 I will leave you with a link to a great review for my 3rd ‘Whimsy Wood’ book, ‘Posie Pixie And The Torn Tunic’, below. This book is specifically for the month of October, so it’s bursting with blackberries and other such autumnal things!